Often I receive book for review and after I read it, it goes on to my bookshelf and just sits there for a long time. 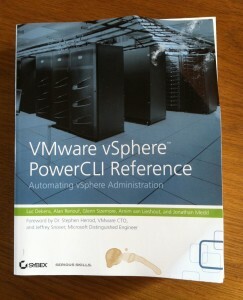 With the VMware vSphere PowerCLI Reference its a different story. The book contains a lot of scripts which doesn’t make it a reading book you keep on your nightstand. This is the kind of book you take with you where ever you go and that clearly shows when you look at my copy. This one I drag along to every customer I visit, just to make sure that I have my “PowerShell bible” at hand when I need it. This book you do judge by its cover, because it shows that it is read often and has become an important part of the toolkit you drag along. The VMware vSphere PowerCLI Reference is written by Luc Dekens, Alan Renouf, Glenn Sizemore, Arnim van Lieshout and Jonathan Medd. I bet you already know these PowerShell guru’s from their weblogs and of course twitter. The book has a lot of good scripts and examples on how to perform a multitude of tasks in your VMware environment using PowerShell. The absolute best thing is the explanation of the scripts and why things are done in a certain way, this however doesn’t make this a book for admins who are just starting with PowerShell. A basic knowledge of PowerShell is needed, but there are many other good books to help you get on your way. When administering a VMware environment, I think the VMware vSphere PowerCLI Reference is a must have !!! To get your copy, visit the book’s website to find a number of URLs where you can order and get a peek on the contents and a sample chapter. Guides, PowerShell, scripting, VMware. permalink. VMware vSphere Web Client: Don’t you forget about me!